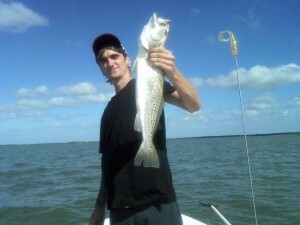 Today, fishing in the Everglades was filled with a lot of great action ! When we left my dock today, we started to head south to the grass flats near Lostmans river, to fish for trout and pompano . The bait we used today for the trout were live pilchards under a popping cork, and for the pompano we used a I inch tube jig. After several minutes into our first drift, we scored, with a trout that was in the 5 lb range! As the morning went on, we caught a number of good size trout, with some nice sized pompano mixed in . After the trout fishing slowed up, we decided to stop by a redfish hole. We were able to catch several nice redfish up to 10 lbs . Don’t miss out on some great fishing! Give me a call, and let me get you out on the water for a day of great fishing!